Super Savings Item! Save 32% on the KKmoon Scientific Calculator Counter 401 Functions Matrix Dot Vector Equation Calculate Solar and Battery Dual Powered 2 Line Display Business Office Middle High School Student SAT/AP Test Calculate by KKmoon at Pear Farm. MPN: MCP8171500923483PY. Hurry! Limited time offer. Offer valid only while supplies last. 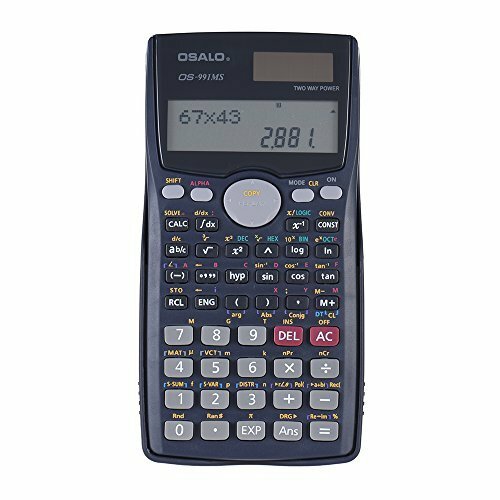 This scientific calculator can offer 401 functions, including calculation basic and complex number, equation(EQN), Matrix(MAT), Vector(VTC) and etc. This scientific calculator can offer 401 functions, including calculation basic and complex number, equation(EQN), Matrix(MAT), Vector(VTC) and etc. 2 lines 10 + 2 display show the formula and result clearly. Ideal helper for middle/high school students and Maths researcher. Ideal helper for middle/high school students and Maths researcher. Comes with detailed user manual to introduce the calculator function and steps. Please read it carefully. Item Size: 15.5 * 8 * 1.4cm / 6.1 * 3.1 * 0.6"
Package Size: 16 * 8.5 * 3.9cm / 6.3 * 3.3 * 1.5"